This probably wouldn’t pass vehicle inspection, even as farm equipment, here in Texas. On the other hand, the setting appears kind of boatish — or is that shippish? — so maybe it doesn’t matter. But seriously this is unacceptable, and bordering on a complete travesty. Combination wrenches and electrical tape!? Are you kidding? The situation clearly calls out for a vise grip or two, duct tape, zip ties, and some paracord, probably in international orange. If you have to use electrical tape, use it for its intended purpose, like a seat belt or something. 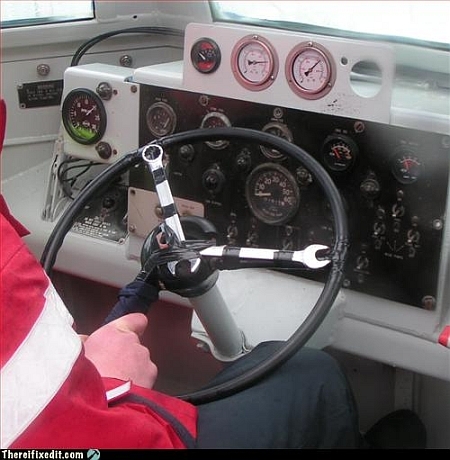 At least put the open-end of the wrench in the middle so you don’t gouge your hand when gripping the wheel. I would imagine that if you busted your steering wheel at sea, you would be tempted to do something like this to get back to shore. Remember, this is only temporary……unless it works. Any self-respecting sailor would have fastened those spanners with finely-worked turk’s heads! Looks like an odometer in that speedometer, so I’m guessing agricultural. According to someone on the “There, I fixed it” thread, it’s a LARC V amphibious vehicle, which explains the boat/truck confusion. Is it just me, or does the gauge on the far left have antifreeze sloshing around in the bottom of it? Hmmm, I had always heard it was boat if it was under 100 feet and ship if over. Unless it’s a sub in which case its always a boat. As early submarines were easily hoisted aboard submarine tenders, and later larger ones berthed on floating dry-docks, subs are called boats. Well the MV Blue Marlin would put anything under 60,000 tons in the class of boat. So most of what the Navy uses today short of an aircraft carrier is a boat? Joe Said: Is it just me, or does the gauge on the far left have antifreeze sloshing around in the bottom of it? Looking at the red on the small gauge on the upper right, I’m thinking that is a reflection. A “ship” has three or more masts, all of which carry square-rig sails. That is the definition. In these post-days-of-sail, it is just a matter of usage. Call big things ships!